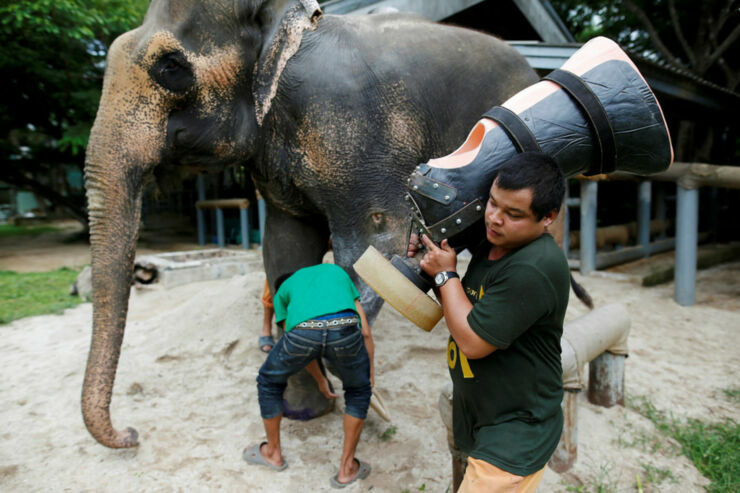 When Mosha the elephant was seven months old she lost one of her front legs after stepping on a land mine near Thailand’s border with Myanmar. That happened 10 years ago and just recently she's been given her ninth prosthetic leg. 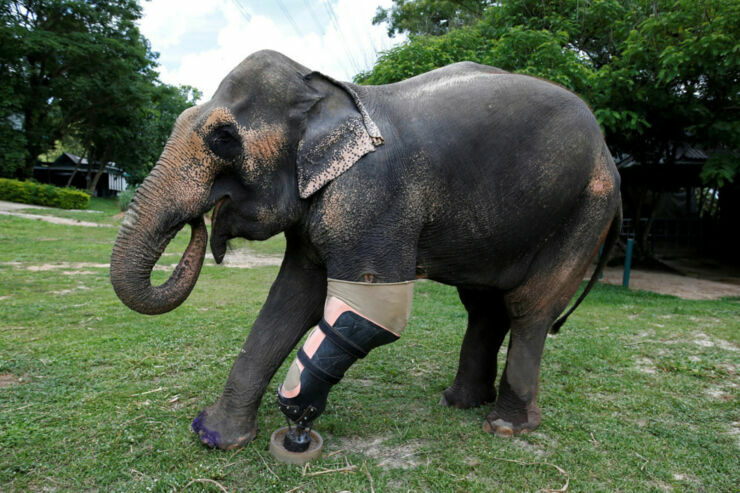 It came courtesy of Friends of the Asian Elephant Foundation who have supplied her with all her prosthetic limbs. When she had the first one fitted back in 2007 Mosha was the first elephant to ever receive one. Over the years as she's grown in both size and weight the strain on her amputated leg has increased, so new limbs have had to be fitted. This ninth iteration, made from thermoplastic, steel, and elastomer, was fitted by the same surgeon, Dr. Therdchai Jivacate, who oversaw her original prosthetic leg. The orthopedist says that without the limbs Mosha wouldn't be able to survive. "The way she walked was unbalanced and her spine was going to bend." Dr. Jivacate told Reuters. "That means she would have hurt her cartilages badly and eventually stopped walking. And she would have died because of that. 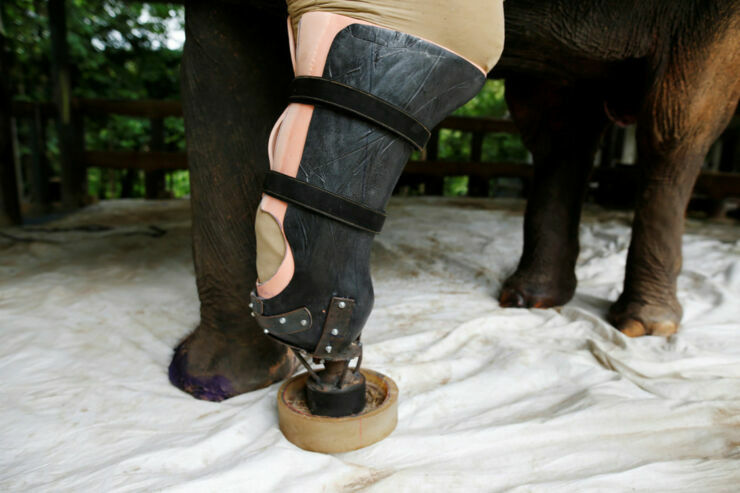 She weighed 600 kilograms when she got her first new limb, but she's now 2,000 kilograms, so we needed to change the materials." Another elephant amputee being treated at the hospital is 56-year-old Motala. 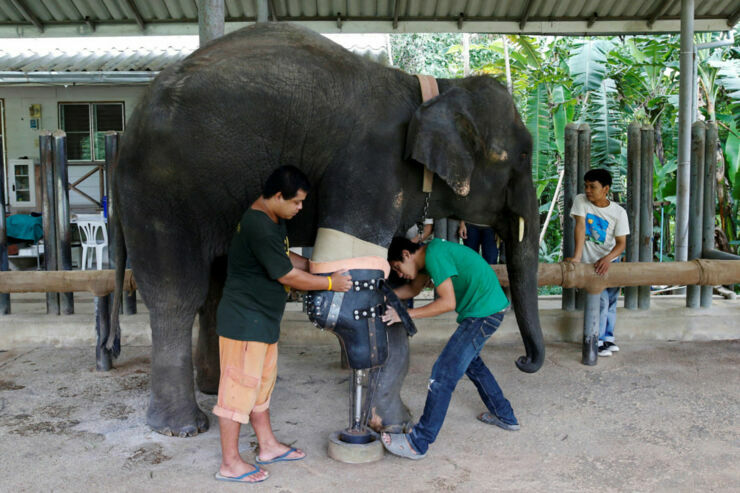 She lost a limb after treading on a land mine on the same Thai border. Rebels have been fighting the Thai government for years and years on the Thai-Myanmar border and one of the results is its now littered with land mines. They're a hazard for the elephants, who are used in the logging industry, because they work in remote areas and forests near these borders. So it's great that they have the hospital and people like Dr. Jivacate to look after them and help them live as full a life as possible as amputees.